My sister jokingly calls me the queen of salads, because I make a whoooole lot of salads! To me, salads aren’t just measly side dishes made from sad boring vegetables. I like to make them substantial meals featuring seasonal veggies and fruits that are looking perfectly ripe at the market. 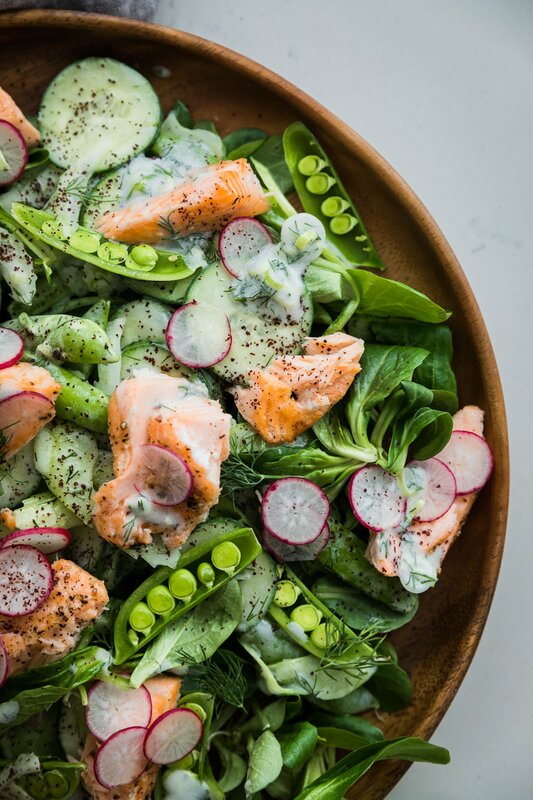 This salad is all about texture– super crunchy and watery celery, cucumbers and snap peas are coated in a tangy light yogurt dressing that is so refreshing for those summer days. The addition of fatty salmon with crunchy raw veggies really makes this into a stand-alone meal. It’s so addictive and the perfect combination of flavors and textures! Preheat the oven to 375 degrees. Drizzle a couple glugs of olive oil over the salmon and season with salt and pepper. Rub the salmon so it is evenly coated with oil and salt and pepper. Roast the salmon on a baking sheet until cooked through, about 10-15 minutes. Make the dressing by mixing the yogurt, 1/4 cup olive oil, yogurt, lemon juice and 1 tablespoon of chopped dill together. Season to taste with salt and pepper. To assemble the salad, put a few handfuls of mache greens on a plate. You could also eliminate the leaves or use a different green. Slice celery thinly at an angle. Slice the green onions' white and light green parts thinly. Slice radishes into thin slices. Slice cucumber into thin slices. Add the cucumber, celery, snap peas, radishes and green onions. 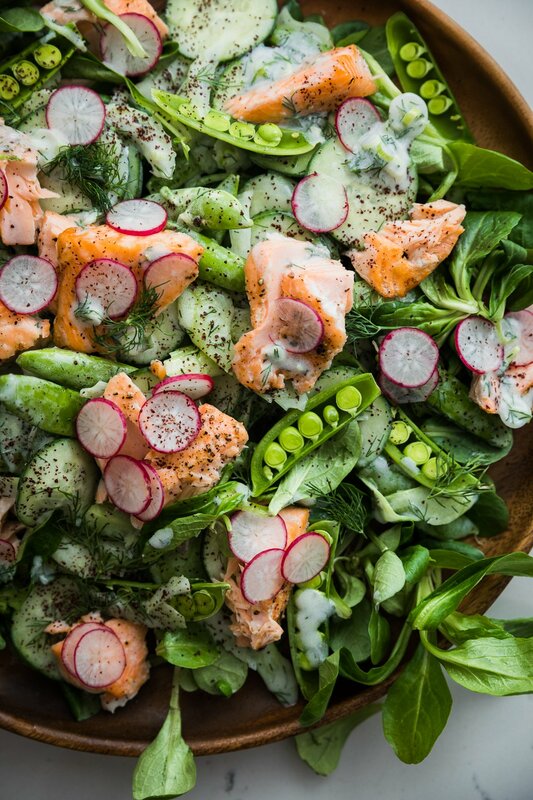 Break up the salmon into medium size pieces and add to the salad. 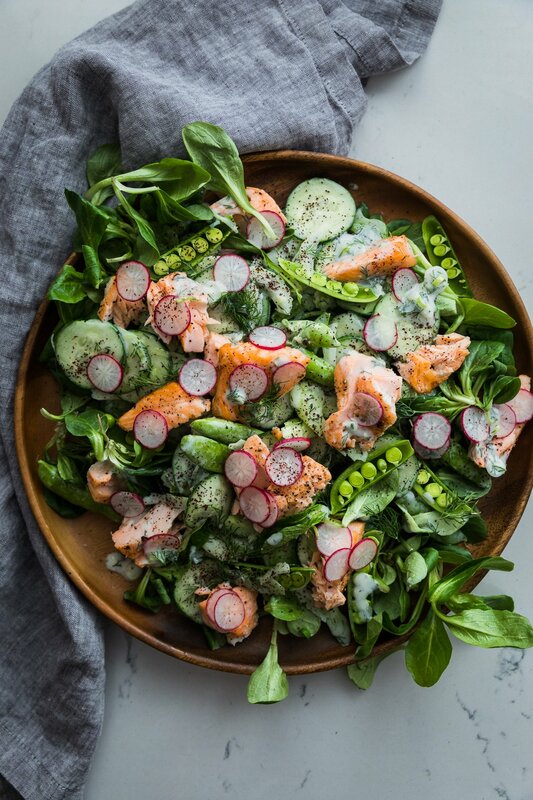 Dress the salad with yogurt dressing and garnish with a few pinches of sumac and extra fresh dill. Season with extra pinch of flake sea salt. I’ve always avoided salads but this past year started making myself eat one every day, and now I really love them. I’m always looking for new ideas – I’ll have to try this one out! Your healthy salad looks gorgeous, Karen! 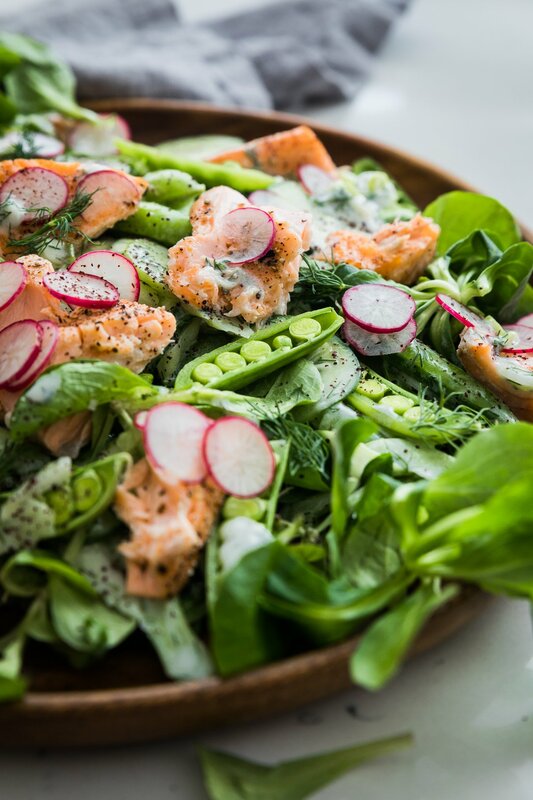 I love it, how you combined the salad composition with snap peas, cut lengthwise. It looks almost like a piece of art. We feel the same way about salads and actually miss them dearly since we cannot get fresh greens in the summer here on the island, but seeing your salad makes me long for the cooler months when we will be able to grow greens in our little garden!